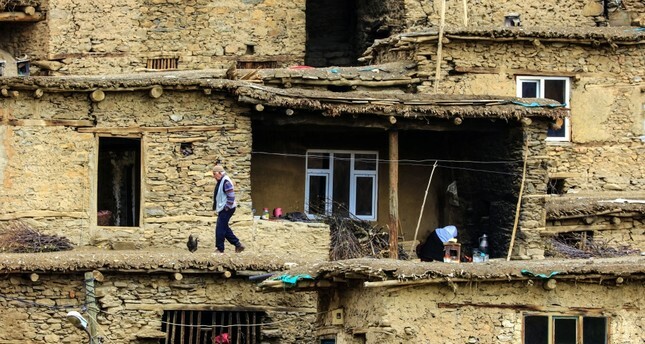 The stone houses of Hizan are witnesses to history for sure, and although they look like they are about to fall apart, Hizan locals have been living in these strange looking houses for decades. Mounted on the hills of Bitlis, Hizan looks like a town frozen in time. With its historic stone houses that seem like they are about to fall apart, Hizan offers a very authentic scene not just to guests, but artists as well. The first settlement in the region dates back to the Urartians in the first century B.C. Throughout history, the region where Hizan is today went has been ruled by the Persian, Roman, Byzantine, and Arab empires. In the 16th century, Hizan became an Ottoman town until it was occupied by Russia in 1913. When the Russians withdrew from the region a year later, the locals returned to their homes for good. Since then, Hizan has remained unknown to most, hidden between mountains that cover 90 percent of the area. Recently, photographers discovered the town and its unique architecture. Today, many photographers and artists from various cities in Turkey meet in Hizan to take photos and paint the town's historic sites and its natural beauty. Photographers, who attended the photo trip titled "Hizan is beautiful for season," recorded the hidden beauty of Hizan on the three-day trip. They photographed the stone houses, a historical layer of the district and the natural beauty of the region. As one of the most important settlements in eastern Anatolia throughout history, Hizan has 10 neighborhoods and 75 villages that have a combined population of 35,000. Apart from its visual beauty, Hizan is also a land of knowledge and education with many madrassahs and külliyes (Islamic social complexes). Offering information on the town, Hizan District Governor and Deputy Mayor Bülent Hamitoğlu said: "So many religious functionaries and scholars were educated in the district and it still preserves its values. Hizan, so to speak, enlightened Turkey. These lands were home to prominent figures such as Bediüzzaman Said-i Nursi and Gavsi Hizani." Noting that photographers from various regions in Turkey took pictures of the district during the three-day event, Hamitoğlu said that they will create an album featuring all of the photographs. "Our main aim is to present the beauty of the region and its people. This event offered a chance to show how terror distorted the area and the innocent side of the region's people," he said. Hamitoğlu stressed that counterterrorism operations are conducted non-stop by the military, police and security forces and Turkey has made a great effort in its fight with terrorism. Musa Mutlu from Malatya, who took part in the contest, said that as a retiree, photography is a hobby for him. Noting that he was awarded with many prizes at the contests he has participated in, Mutlu said: "I visited the area two years ago as its nature and structures attracted my attention, and this year I decided to participate to this contest. I think I will visit Hizan again. The nature is great here," he said. "Hizan is a mesmerizing district. Its nature takes us to the old days. Its villages are like the villages we used to live in in the past. I hope it will not be distorted due to construction. In the villages, people welcomed us very nicely, they were so hospitable," he said.